Q. I have sensitive skin. Every time I wax, it leaves my skin red with acne on my skin. I have never tried an epilator because I heard it is painful. I think it will make my skin worse. Is it suitable to epilate my skin? If so, what is the best epilator for sensitive skin? Thank you for your question. I completely understand. Finding products that work with sensitive skin is super hard. People who have sensitive skin tend to easily break out with rashes or get acne in response to certain products. The skin may get tingly or itchy after waxing. This is completely normal and is very common on more sensitive areas like the face and bikini area. One of the most common side effects with hair removal is that there is some degree of redness or inflammation, but in your case waxing is causing acne. Sensitive skin can be very problematic since it is very delicate, requiring the right type of care and a lot of trial and error. It can be hard to find the right product and hair removal methods that work for sensitive skin. With sensitive skin, I recommend that you always spot test on a small area before moving onto a larger area. Now it might be something in the actual wax or the actual act of waxing that is causing your skin to breakout. Some waxes have artificial colors, fragrances, or ingredients. If it is something in the wax that is causing your skin to react, epilators might work for you. Epilation is painful when you first start, but I have written about how to reduce the pain of epilation here. With epilation, the tweezers don’t pull on the skin directly like you get with waxing. If you choose this route, consider getting a wet and dry epilator. It is suitable for those who have sensitive skin or those just starting out. Through our testing, we found that epilation caused a lot less irritation and is much less painful when performed under water. The foam protects the skin from direct contact with the epilator head surface. It does take a lot more time and the results aren’t as thorough but if your skin is easily irritated it might be the only option. The right preparation is critical. Exfoliate the day before to remove dead skin and prevent ingrown hairs. If you are getting allergic reaction that produces hives on the skin, take an anti-histamine like Benadryl before epilating. Start by cleaning your epilator. Before you start epilating under water cleanse the skin with 100% tea tree oil. Always use warm water not hot. Use a good shave gel for sensitive skin to help the epilator glide easily over the skin. This will help buffer the skin from direct contact with the epilator. 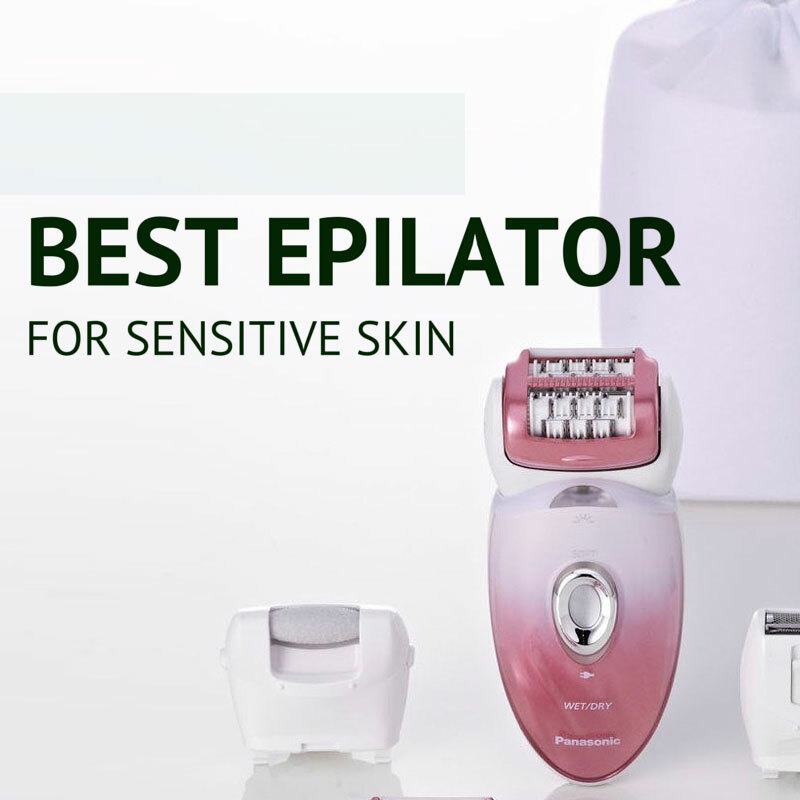 Next, you want to choose the right epilator for sensitive skin. Which epilator is the best? We reviewed most of the most popular epilators on the market and found that the Panasonic ES-WD51-P caused the least irritation, which is why I think it is the best epilator for sensitive skin types. Dry epilation can put pressure on the skin whereas wet epilation minimizes direct contact. The Panasonic epilator works with foam or shower gel. Both attachments it comes with help pull the skin out with the least irritation. When epilating, work in small sections from the bottom of the leg to the knee area and avoid going over the same area too many times. It’s okay if you don’t get all the hair as you can try again after a week or 2. After removing hair from the root, there are a ton of micro cuts on the skin that may open up your skin to a bacterial infection. I like to clean the skin with 100% tea tree oil or 100% witch hazel to prevent against infection. Typically, you want to finish up with something that with soothe the skin. I recommend icing the area for about 10 to 15 minutes after and then using 100% aloe vera. Make sure it doesn’t have any additives like alcohol. It will help calm and hydrate the skin. Since you have sensitive skin, sometimes you might find it is best to wait a few hours or till the next day before applying anything. Go by your own skin. Some products can exacerbate the problem. You definitely don’t want to remove hair from the root if you are using Retin-A. Stay away from products with alcohol, beta hydroxy acids, and retinoids. Sometimes skin is too sensitive even without using these products. If you find that epilation doesn’t work for your sensitive skin look into sugaring which may leave skin less irritated.